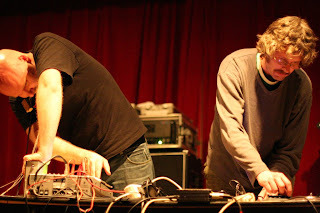 The final duo by Jazkamer (Lasse Marhaug and John Hegre) produced a set lacking in any focus or direction, an aimless, energy fuelled heap of wildly twisted dials and runaway power electronics. It was loud enough to clear half of the exhausted room to the lobby, but the volume was not the problem. I have no idea how much control Marhaug and Hegre had over the resulting music – they barely looked at their equipment as they wrenched it about – but it suffered from a complete lack of depth and substance, consisting of little more than a scrambled screeching mess of sound. As it came to an end my escape from the hall was rapid.